Fortunately, most full-size keyboards have sane key layouts. There are two issues with modern keyboards that drive me crazy. One is the "menu" key introduced by Microsoft some time around Windows 95. Notice that I don't even mind the Windows logo keys that much. An additional modifier key is sometimes useful. Mac keyboards have three modifier keys on the bottom row, classic Unix keyboards often had them as well. I don't even care that it's the Windows logo, not some OS-agnostic symbol. But the "menu" key? What is it for? I don't think I've ever seen it used for anything. It's useless and it messes up the symmetry of the layout (three modifier keys on each side of the space bar). It also means the space bar is too short. So that's the first of my keyboard-related pet peeves. As you're about to see, I care about the second one much more deeply. 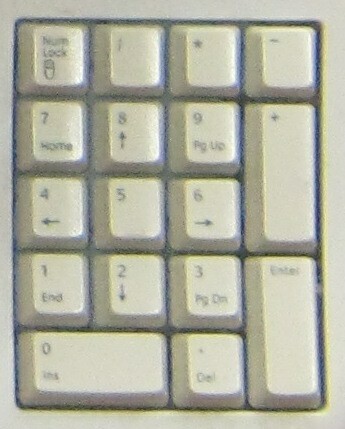 Numeric keypads. I hate them. I guess they're useful if you're an accountant and must input a lot of numbers into your spreadsheets. I'm not an accountant. I imagine to most people the numeric keypad is as useless as it is to me. The last time I remember using it is when we were playing Mortal Kombat fifteen years ago. So what, I hear you say. Just don't use it. But you see, it takes up space that I need for something else, namely the mouse. 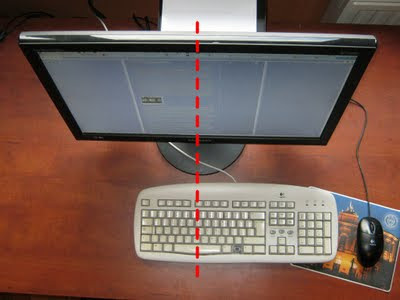 I need my keyboard positioned so that the monitor's symmetry axis goes between the G and H keys. 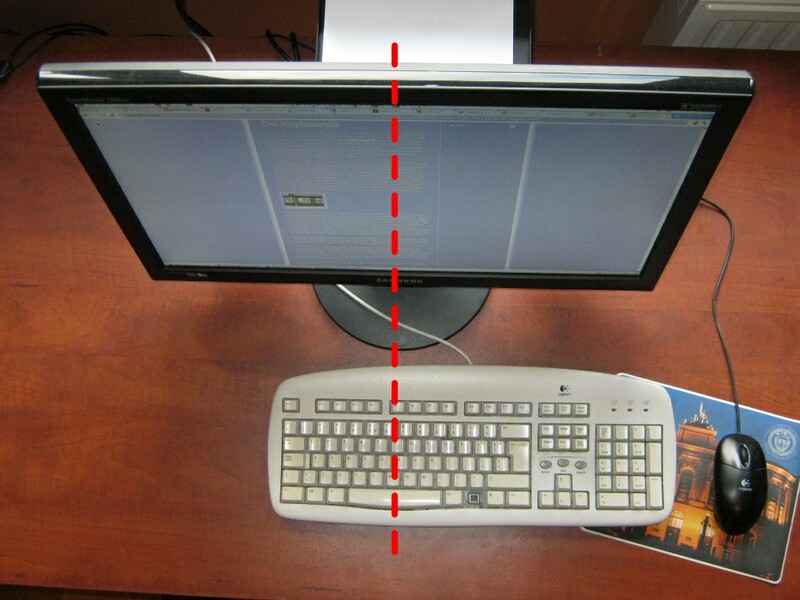 That way my arms are positioned in a natural symmetric way when typing. That means that if my keyboard has a numeric keypad, the mouse goes too far to the right. I'm pretty sure it's not just annoying, but also not good for my posture. In a lot of ways, it is the Holy Grail. An elegant weapon for a more civilized age. No numeric keypad, no stupid Windows keys. Built like a tank. Likely to outlive its user. There are downsides though. And I'm not even talking about the loud click, which is sure to drive your coworkers and roommates crazy. 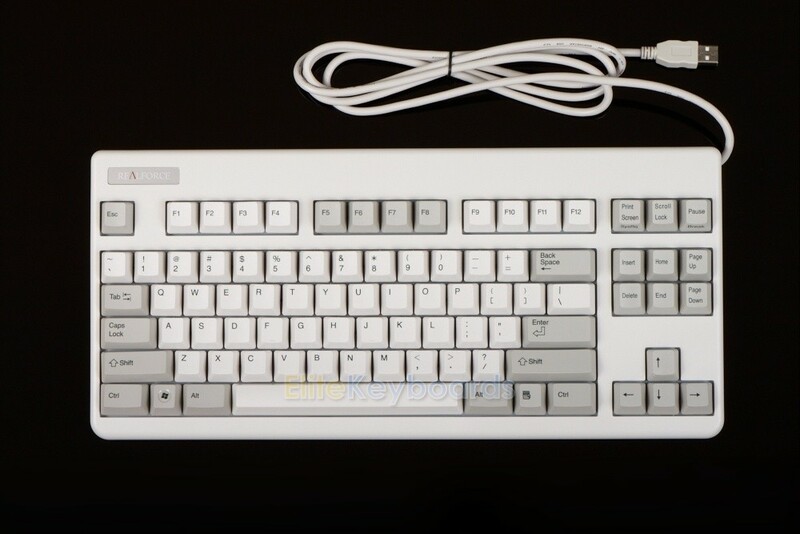 Problem is, the keyboard is long out of production and it is the less popular variant of the Model M. So when one of them shows up on eBay, it easily goes for more than 200 USD. As you can see, it has the Windows logo keys, but as I said, they don't bother me. What's important is that there's no "menu" key next to the right Control. And no numeric keypad of course. What's the catch? The keyboard might be in production, but it doesn't mean it's cheap. 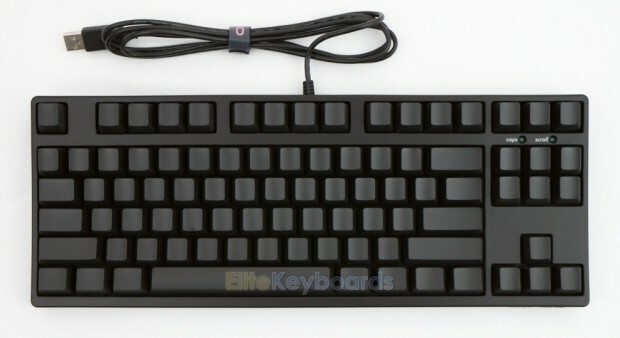 It currently goes for 265 USD on EliteKeyboards. Ouch. I'm not aware of any cheaper keyboards that would match all my criteria (no menu key, no numeric keypad, standard full-size layout otherwise). If you're not ready to shell out two hundred bucks or more on a keyboard, you have to start making compromises. The one I'm probably willing to make is to accept the menu key. I still think it's extremely idiotic, but I guess I can live with it. If we allow the menu key, that opens up several possibilities in the 100-150 USD range. 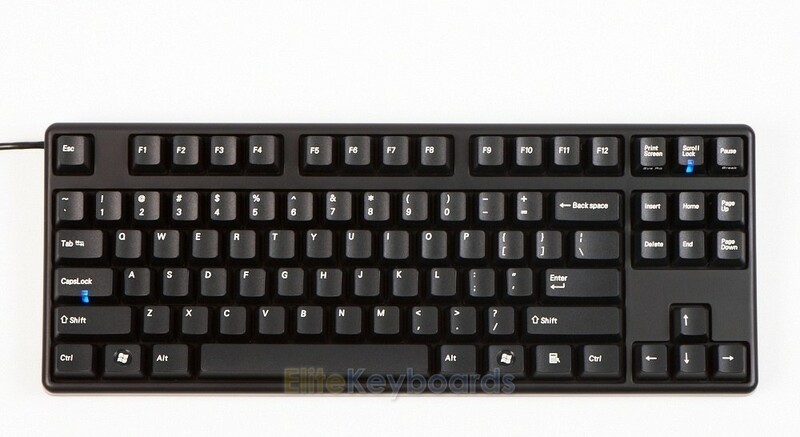 EliteKeyboards currently carries some nice keyboards from Leopold and Amazon has several Filco Majestouch keyboards to choose from. Both brands seem reasonable, but they're still a bit pricey. Like I said, most keyboard geeks obsess about the mechanical switches ("Cherry" switches in the case of Leopolds and Filcos) and they don't come cheap. An important thing to know when looking for keyboards with no numeric keypad is that they're called "tenkeyless". Don't waste your time looking for "space saver" keyboards as they're almost always some ugly layouts that keep the numeric keypad, but drop the arrow keys/page up/page down area (a notable exception is the Model M mentioned above). I really don't understand the thinking behind such layouts. What I understand even less are the laptop keyboards with numeric keypads. And they are getting popular. I guess on 15-inch and bigger laptops there is enough space for extra keys, but why would you waste it on a numeric keypad and not, say, reasonable sized arrow keys and page up/page down etc. Another problem with such laptops is the already mentioned asymmetry. It's impossible to position your arms comfortably when typing, when the home row of the keyboard is shifted to the left (and obviously you can't reposition the laptop's keyboard in relation to the screen). It turned out to be more difficult than I thought (the keyboard looks cheap, but there's a metal plate inside that I had to saw off) and it may not look pretty, but in the end I have a keyboard with a reasonable layout that didn't cost an arm and a leg. If you want to try it yourself, some instructions can be found on wikiHow. 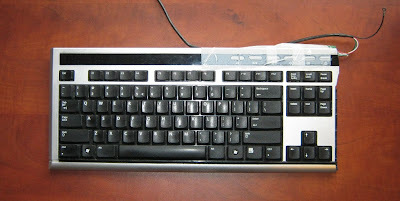 Obviously the details will depend on the exact keyboard model that you choose to lobotomize. If you're considering becoming a keyboard otaku, I strongly recommend that you check out geekhack.org, they have an active forum and a wiki with more information on keyboard switches than a sane person needs. Update (September 2012): As of right now, the CM Storm Quick Fire Rapid seems to be the most reasonably priced tenkeyless keyboard. The Cherry MX blue version goes for 64 USD on Amazon. Update (August 2013): I just found this HP keyboard, not very pretty, but with mostly correct layout and only 26 USD on Amazon.